‘Visiting Gozo the first time, I truly felt inspired by diving the caverns and rock formations, so decided to look for future training in similar environments. 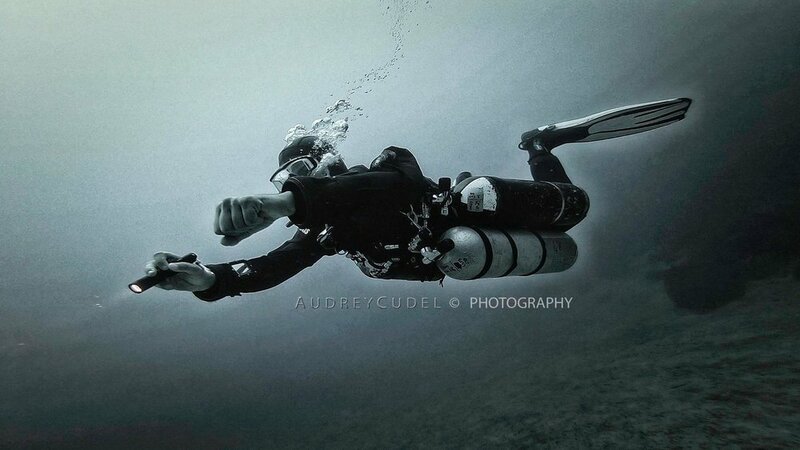 This way I discovered Gozo and started my Sidemount and Cave training with Audrey Cudel. I cannot recommend anyone more than her. She is a very dedicated Sidemount and Cave Diver and Instructor, has impeccable knowledge about this activity and the environment and is also a very talented underwater photographer. Also she has marked pedagogical skills and a good mindset for teaching. The training is conducted in a tough, demanding, and thorough manner in the best standards available. 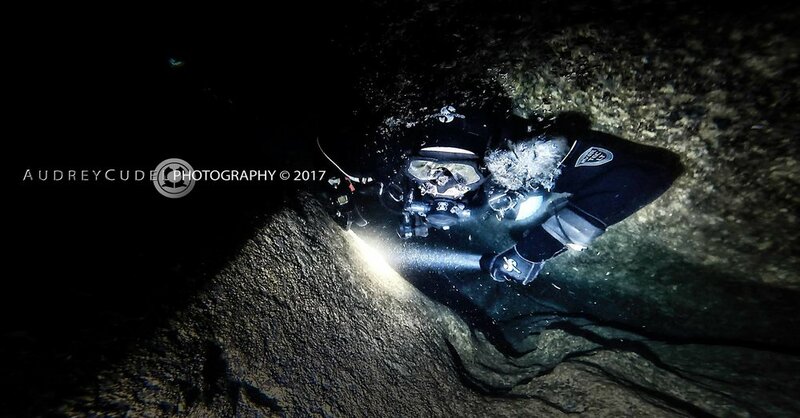 A large number of training courses is scheduled all year around enabling good access to cave diving training and individual arrangements are possible upon consultation. ”I first contacted Audrey to properly learn the concepts of sidemounting a few years back. Not only did she have expert teaching abilities in sidemount. She also expanded my general knowledge and skills in many other areas of diving. One could tell that she had gained this knowledge out of first hand experience. Audrey also introduced me to cave-diving a while later and it was once again a solid professional experience. I will never forget my first dive in Nohoch Nah Chich..."
’Audrey Cudel’s beautiful pictures of sidemount- wreck and cavedivers made me come to gozo to meet her in person and learn from her. 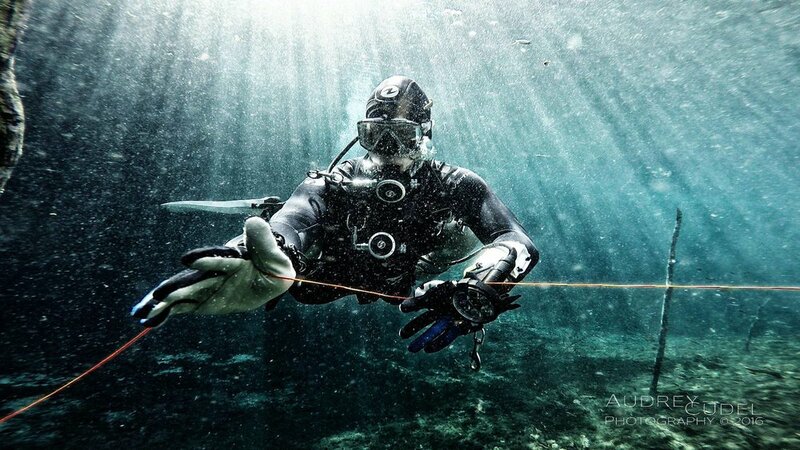 Being away from tech-diving for a while I did not only learn how to properly dive sidemount. She also boosted my interest in making better underwatervideos, training harder for my goals and getting more confident in tight spaces again. Seing her pictures and videos makes me feel like being with her , they are pieces of art and one can feel the presence of a great diver. Like always great people are a magnet for other great people and so I made friends there with great attitude and wisdom. ‘Having made the decision to improve my level of diving at an early stage, and by exposure to a number of very positive recommendation from the UK and on holiday in Corfu, I booked an Intro to Tech with Audrey in 2015. At the time I had around 30 dives in total but had been amazed at the level of control in the water I had seen from what I had come to learn to be divers with technical dive training. I was also fascinated with the difference in kit and process. Audrey approached our training with an equal balance of seriousness and attention to detail, and humour and patience. Her level of professionalism and knowledge of the subject was inspiring, and we managed to complete the Intro to Tech and also Advanced Nitrox with simulated run time and Backmount, in a way that i can only describe as a total pleasure. I since went on to train further with Audrey in Cavern and Intro to Cave which was a demanding but very satisfying set of courses which were performed in Sidemount. Audrey herself being involved in the Mexico cave diving scene and exploration made her one of the most informed instructors in this particular area, and it is clear that years of experience had gone into each and every detail I was trained on. Something that also struck me when training with Audrey is that she will never just stop at the syllabus, but gives her knowledge of wider experiences as context to every point taught. There is also no end of advise when it comes to kit, and you can be safe in the knowledge that she will have tried and tested all that she describes for some time, to be sure she passes on something way more than a catalogue description. The additional tuning of set up, advice post training, and the honest and intelligent approach to explaining reasoning were truly awe inspiring and I believe have made me a far better and more rounded diver, which is a credit to her warm and approachable style. I could not recommend Audrey more whole heartedly. She is a dedicated and passionate instructor who leaves no stone unturned. I feel honoured to have been given the gift of her experience, and to hopefully one day pass that on to others’. ’Audrey, you have challenged me! You showed me my limits! You comforted me and rebuilt me again. But I do not regret one minute with you! Audrey, you are training your student with passion and do not just a job! I've learned a lot about sidemount diving, but also about life.